To generate buzz about the 75th anniversary of Esquire, the PR teams at Hearst and DKC sought to illustrate the magazine's iconic value. To generate buzz about the 75th anniversary of Esquire, the PR teams at Hearst and DKC sought to illustrate the magazine's iconic value. It also wanted to point out the future of print by highlighting the magazine's use of the first digital e-ink cover, which is like electronic billboard that flashes on and off in different sequences, for its anniversary issue. The PR team's media goal was to ensure coverage from editors who might usually have shied away from anniversary stories. “We wanted a lot of hype, a lot of buzz, a lot of interest,” says Adam Schiff, SVP at DKC, AOR for Esquire. Strategy was based around the e-ink cover, Schiff adds, and the team kicked off the campaign by securing a business story in The New York Times. It also looked to partnerships with Ford and Borders to broaden its consumer reach and leveraged editorial content to create hype. Each of the 75 people featured in the anniversary issue were invited to the Hearst offices, where the artist Lincoln Schatz had created a 10-by-10 plexiglass box. Inside the box, people like Jeff Bezos, CEO of Amazon, read a Kindle and Marc Jacobs did yoga, Christopher says. “The Cube” generated art and celebrity press. 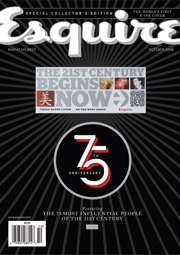 At one point, the Esquire Web site encouraged hackers to hack the cover. All 100,000 copies with the e-ink cover sold and advertising revenue for the issue was the highest for any October issue, Schiff says.